Submitted this week on Edelweiss+ using the "send to SIBA" option. Thanks to Avid Bookshop, Bookmarks, Bookstore Number 1, Fiction Addiction, Flyleaf Books, Fountain Bookstore, Lemuria, Malaprop's, McIntyre's Books, Square Books, The Country Bookshop, The Oxford Exchange, The Story Shop, Underground Books, and Union Ave. Books. "Rush is chock -full of many surprises. Patton presents all the fun parts of a sorority: the life-long friendships, exciting rush week, sympathetic and loving staff; and combines it with real life." "a fascinating and sometimes disturbing look at the man behind the genius of Apple." " As much I love shorter books sometimes, this one I wanted to be longer. This is one of the best retellings [of Pride and Prejudice] I have read to date." "Folkloric, tragic, and surreal. " "one of those stories which reads more like southern Gothic fiction, but is as real as it can get. " "I'm a big fan of the gothic novel, so a modern retelling of du Maurier's Rebecca is RIGHT up my alley." Matchbook is a marketing firm dedicated solely to independent bookstores. Sign up at our booth and receive $100 off any website package and/or $200 off our coop-based Dec/Jan print newsletter for first-time participants. Best part about being a bookseller: Introducing someone to a book or author they didn't know about and then having that customer come back and say "that was amazing!" I will say, I equally love it if someone has an opposite reaction to a book than I did as it often sparks an interesting conversation. Best thing you did this year at your store: Other than successfully opening (! ), I am really proud of diversifying our programming and reaching a wider audience than we ever have before. Getting new people in and reaching out into new pockets of our community is really a huge part of our mission and I'm extremely proud of how far we've come this year. Social Media Stats (FB likes, Twitter followers, etc): 5,362 likes on FB, 1,095 Twitter, 1,825 Instagram, 5,000 e-newsletter subscribers. What are some ways you work with your community? Oh goodness, where to start. Since we're a nonprofit, we are involved in our community at every level. We work heavily with our schools, we collaborate with approximately 75 nonprofit organizations and companies each year on events, and we try to create opportunities for people to engage with each other. We host a monthly Social Justice Storytime that has highlighted several groups, including recent refugees to our community through World Relief, Autism awareness, domestic violence, and more. 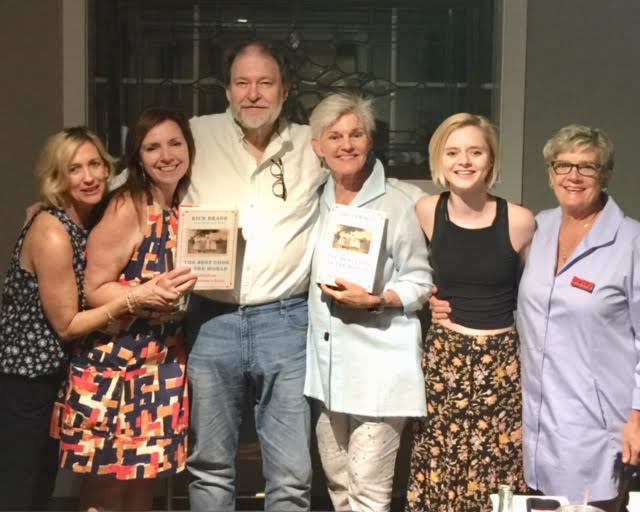 We're working with several groups to cultivate community book clubs, like Pride Winston-Salem on an LGBTQ book club, and a local nutrition therapist on a body liberation book club. Do you have any community partners you work with regularly? Several! Some of them include: RiverRun International Film Festival on their films that are based on books or books about film, a/perture-our local indie theatre on basically the same, Family Services, Junior League, Head Start, Chamber of Commerce, Forsyth County Public Libraries, Winston-Salem Writers, Salemtowne Retirement Community, Piedmont Opera, Winston-Salem Symphony, Kaleideum Children's Museum, Imprints Cares, Hispanic League, Hospice & Palliative Care Center, Arts Council of Winston-Salem/Forsyth County, and Old Salem Museums & Gardens. Do you have passions that carry over into your bookselling life? Well, since my number one passion in life is reading, I'd say yes! I also enjoy wine, so it's also great that we share a space with a local brewery/coffee shop. Top priority for 2018: This year, we are beginning a new initiative called Book Build: Fostering Connections by Building Collections. It has come out of our work with area schools and the realization that so many books in their collections are incredibly out of date and therefore irrelevant. Most children living in poverty will only come into contact with books through their school libraries. That means the books in our school libraries not only need to be current, children also need to be able to see themselves in the books they read. We have this amazing opportunity to change a child's life. Our goal is to raise enough money to provide our schools with 25,000 new books by 2020. It's very exciting and we can't wait to get these books to the schools. Favorite SIBA programming benefit: I always get so many new ideas from talking to fellow booksellers and hearing what works/doesn't work in their stores. I always come away from any kind of networking event with one or two ideas to put into action in our store and community. The Stars Aligned for a Stellar SIBA Revival in Southern Pines! A Stellar SIBA Revival in Southern Pines! 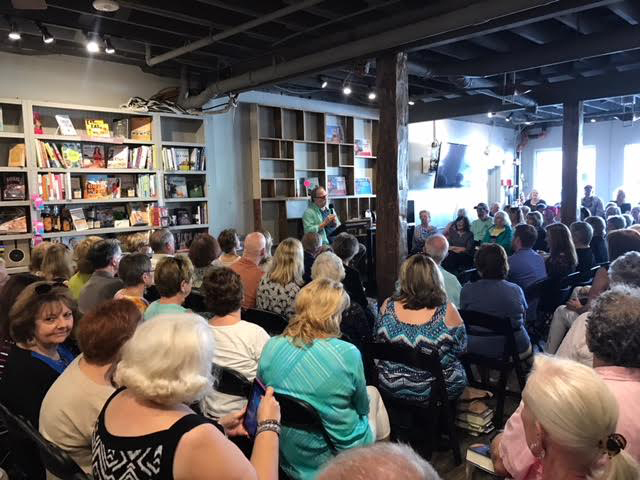 On Friday, July 20, booksellers from McIntyre’s Books, Quail Ridge Books, and The Country Bookshop gathered for a SIBA Bookseller Revival. SIBA Board member Kimberly Daniels Taws presented with Josh Floyd of IngramSpark, giving an overview of how bookstores are utilizing Ingram Sparks’ services in various ways. Kimberly and her team shared their experiences working with local authors, and their approach to publishing with IngramSpark. They help local authors publish their own work, or publish for them. Their services include project management, local expertise, and quality book production. The Country Bookshop has published two authors under their imprint, with plans for more. They also offer authors resources to DIY. Ingram Sparks’ Josh Floyd explained how his program works in bookstores across the country in ways similar to Kimberly’s, from being a part of a program offered to authors, to becoming the printer for a bookstore’s imprint. He praised Eagle Eye Book Shop of Decatur, GA for their success with offering marketing services to authors. Josh also offered samples of store and business-branded journals, produced by IngramSpark, and an example of a calendar that stores could replicate if they wanted to do a store or community calendar. Booksellers spent the afternoon brainstorming for next year’s Independent Bookstore Day, NC-Piedmont Style. Look for some great things to happen for the twelve indie stores participating! Outstanding books on history, culture, literature, the arts, natural history, gardening, and cooking in the Southeast and beyond. Great gift books through Seaside Publishing. Show Special: 48% trade discount titles; 45% short discount titles; no minimum fee; free freight. Good through October 26 with code SIBA18. SIBA wants to help readers of all ages better understand the plight of refugees and immigrants as they seek to make new homes and rebuild their lives. We've built on the efforts of Avid Bookshop’s Manager of Children’s Books, Hannah DeCamp, to offer member stores and consumers a book list on the timely topic of refugees. Our list includes titles from Avid's "Books for Kids Featuring the Immigrant or Refugee Experience” as well as titles recommended by publishers. We're continuing outreach to publishers and will keep adding to the list. If you know of a title you’d like us to add, please email lindamarie@sibaweb.com. Consider using the SIBA list on your e-commerce site to prompt awareness of this issue, and purchases for donation to schools, libraries, and those working with immigrant communities. Thank you for your help!
" Miller’s writing is beautiful, clear, and bright." "a deliciously hard to put down who-done-it that feels all too close to home." "With any luck, CRUDO will be one of most talked about books this year. I sure hope so." "Creepy in all the right ways, wonderful characters, I loved all of it. " "the page-turning southern memoir of the year, y’all, I mean it. " "Louisiana Elefante is the kind of twelve-year-old you want to go on a road trip with." Bookstores interested in participating please contact Kristin Stadum at 2000libroscampaign@gmail.com for information on shipping, downloadable flyers, and to be part of the official campaign. Participating bookstores can add the 2,000 Libros’ wishlist to their site, to encourage customer purchases for donation. Here’s how the wish list is set up by Politics & Prose on their site. Bookstores needing assistance with shipping costs to detention centers might consider adding that element to their fundraising efforts. If you are an author, industry affiliate, or consumer friend of SIBA, contact your local independent bookstore and let them know about this campaign. It’s easy for them to participate, and your donated purchase also supports the bookstore. Still have questions? Please contact lindamarie@sibaweb.com. I get all the books I want to read and more, love the customers, and want them to read the books I love. We work with partners when we need a larger space: our library, Fairhope United Methodist Church, retail partners like Running Wild. Do you have any community partners you work with regularly? Denham Springs Main Street, Denham Strong and the Livingston Parish News are our more frequent collaborators. Do you have passions that carry over into your bookselling life? My passion is the book, sales reps, authors, SIBA board and the store and that is my life. Best part about being a bookseller? : You know this is an impossible question, right? Today I will say this: I have been blown away by the breadth and depth of friendships I've formed as a result of my bookseller role. From publisher reps to authors to coworkers to customers, I have a community of people who really understand me; after all, we speak a common language--the language of books. What book(s) are you reading? : I just started Jessica Handler's 2019 novel, The Magnetic Girl. I'm a huge Jessica Handler fan and am loving it already. Yesterday I finished Heartbreaker by Claudia Dey and Jason Reynolds's For Every One. Best thing you did this year at your store: We've always made it known that we're in support of human rights, free speech, and anti-discrimination, but this year we've become even more outspoken.Through various in-store and offsite events and initiatives, we remind readers far and wide that we see them and want to hear all stories. Social Media Stats (FB likes, Twitter followers, etc): 9,336 Twitter followers, 8,343 Facebook followers, & 12.8k Instagram followers. What are some ways you work with your community? In addition to frequent events and book clubs, we have two initiatives that allow us to participate meaningfully as Athens citizens: #avidgivesback and #avidinschools. These programs are ways for us to donate volunteer time, money, and in-kind donations to nonprofits, schools, and organizations that are making our city--and our world--better places. One example is the #avidgivesback project dreamt up by bookseller/Will Walton. 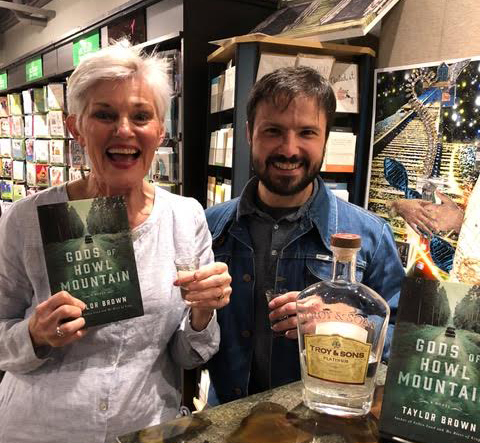 For every copy of his May 2018 novel (I Felt a Funeral, In My Brain) that was preordered at Avid, the bookselling staff committed to 25 minutes of volunteer time at the Athens Community Council on Aging's Grandparents Raising Grandchildren program. Do you have any community partners you work with regularly? Yes, we have so many community partners it's hard to name drop just a few! From various departments and clubs at UGA to famous rock clubs downtown to our nonprofit arthouse cinema to the Clarke County School District to our local library to the leisure services department, we work with groups that touch the lives of nearly every part of the Athens population. Do you have passions that carry over into your bookselling life? I definitely have passions that carry over into my bookselling life! I'm a professional patient advocate, writer, and speaker at migraine.com, and I've used skills honed in that role to be more of an advocate for my staff and for myself as a small business owner. Oh, and my two cats, who make frequent appearances under the #petsofavid Instagram hashtag. Top priority for 2018: We're more than halfway done with the year, and I'm not sure I've made as much progress as I'd wanted to by now on one of my goals: to streamline the business, cut down on costs, and improve our profit margin. I know this is everyone's goal, but I'm making it a priority this year. Slow and steady wins the race, I hope! Favorite SIBA programming benefit: While not listed as a specific benefit when you sign up for membership, the access we have to Linda-Marie and Wanda has been invaluable. To have two industry experts always eager and willing to pick up the phone or exchange some emails about unexpected issues or fun new ideas is amazing.